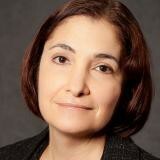 Karla McKenna is an international standards specialist in the area of financial services. Ms. McKenna is director of Market Practice and Standards at Citi and in this role drives development and adoption of financial services standards for Citi’s Securities businesses. Ms McKenna serves on the Board of Accredited Standards Committee X9 (ASC X9) and is a member of the inaugural Board of the Eurofiling Foundation, and in May 2015, Ms. McKenna began a secondment to the Global Legal Entity Identifier Foundation (GLEIF) as the Head of Standards for the GLEIF. Ms. McKenna chaired the International Organization for Standardization Technical Committee 68 (ISO/TC 68), Financial services,from 2006 to 2018 and continues work with the committee in the areas of regulatory use of international standards and on the refinement of reference data standards.. Ms. McKenna is Immediate Past Chair of the Securities Market Practice Group (SMPG) and also has served on the Boards of the International Securities Association for Institutional Trade Communication (ISITC) and XBRL International. Check out the incredible speaker line-up to see who will be joining Karla .